U.S. Secretary of State Rex Tillerson and Homeland Security Secretary John Kelly met Thursday with Mexican President Enrique Pena Nieto and members of his cabinet, in what is expected to be the first in a series of high-level meetings focusing on drug trafficking, trade and immigration. The two key members of President Donald Trump’s Cabinet were hoping to soothe concern and anger about the new U.S. administration's policies toward Mexico. "We are going to have a good relationship with Mexico and if we don't, we don't," Trump said at the White House Thursday, a day after his press secretary Sean Spicer referred to bilateral ties as "healthy and robust." The trip comes at what is seen as a low point in relations between the two countries, which have enjoyed peace along their 3,100 kilometer-long common border since the Mexican-American War of the late 1840s. Trump has repeatedly insisted that Mexico, one way or another, must pay for a border wall, which lawmakers in Washington estimate would cost at least $12 billion. And just this week, the U.S. Department of Homeland Security outlined policies that could result in the deportation of millions of undocumented immigrants. "We're getting gang members out. We're getting drug lords out. We're getting really bad dudes out of this country," Trump said Thursday about his administration's immigration policies. On Wednesday, Mexican Foreign Minister Luis Videgaray said his country will not accept new "unilateral" U.S. immigration proposals and will not hesitate in taking the matter to the United Nations. “This is a low point in U.S.-Mexico relations, and an abrupt break from the last 30-plus years of cooperation,” said Shannon O'Neil, senior fellow for Latin America studies at the Council on Foreign Relations. U.S. 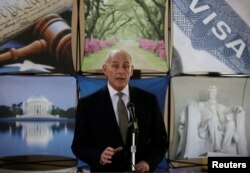 Homeland Security Secretary John Kelly addresses the media at Guatemala's air force base in Guatemala City, Feb. 22, 2017. DHS Secretary Kelly, a retired Marine Corps general, has long-standing relations with Mexican leaders from his previous job as head of the U.S. Southern Command. Before heading to Mexico, he went to Guatemala to meet with President Jimmy Morales and observed the arrival of a DHS repatriation flight at a government facility in Guatemala City. U.S. officials said Secretary of State Tillerson, who is a former an oil and gas corporation chief executive, and Kelly will discuss border security, law enforcement cooperation and trade, among other issues. Aside from President Nieto, the two are also scheduled to meet the Mexican ministers of interior, foreign relations, finance, national defense and the navy. The talks come weeks after Trump and Nieto spoke by phone on January 27, following the U.S. president’s inauguration. The call did not go well, according to officials in both countries who spoke on condition they not be named. Media reports say Trump chided his Mexican counterpart for failing to control drug trafficking and suggesting the United States might even deploy troops to defeat narcotics cartels on Mexican territory. FILE - Mexico's President Enrique Pena Nieto speaks during a press conference at the Los Pinos presidential residence in Mexico City. President Nieto then canceled a planned trip to Washington. Mexican officials have rejected calls by Trump to pay for a border wall. “Mexico wants to build bridges, not walls,” Mexican foreign minister Videgaray said last week. Despite the serious differences on a number of fronts the official added, “I think we’ll achieve a lot of success," the senior U.S. administration official said. That may prove to be too optimistic of a prediction, according to some regional specialists. “While the visit will go some way to smoothing bilateral discussions, there is a hard-earned trust that has been broken, and that can't be repaired with a high level visit,” O'Neil told VOA. During the 2016 presidential campaign, Trump referred to Mexican immigrants in the United States as rapists and criminals. Another U.S. official said it is “important to view this with a very long lens” and not focus on any particular contentious aspect of the relationship. “Both presidents are keen to set a positive tone, a constructive tone moving forward," the official added. 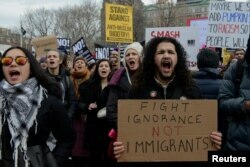 People participate in a protest against U.S. President Donald Trump's immigration policy and the recent Immigration and Customs Enforcement (ICE) raids in New York City, on Feb. 11, 2017. While the two Cabinet members look to smooth relations, they will also be explaining the latest orders issued by Trump regarding immigration and deportations. Rice University Latin American analyst Mark Jones said with those moves, Tillerson's trip is "mission impossible." "The goal of Tillerson’s trip was to improve and soften and try to smooth over the friction that’s occurred previously in U.S.-Mexico relations, but just before he goes the Trump administration releases this new memorandum that’s seen as an affront to Mexican dignity," he said. New policies being enacted at DHS will lead to hiring thousands more enforcement agents, expanding the number of immigrants targeted for deportation, prioritizing removal hearings for them and obtaining the help of local police to make arrests. The actions have generated alarm in other countries, none more so than Mexico -- the origin of an estimated six million undocumented people in the United States. 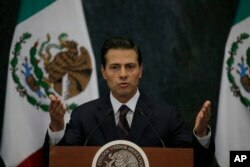 Such actions are prompting calls from prominent Mexicans for pushback. 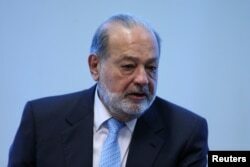 FILE - Mexican billionaire Carlos Slim speaks during a news conference in Mexico City, Mexico. Mexico’s richest businessman, Carlos Slim, who some want to see run for president next year, during a recent rare news conference called for people in his country to buy domestic products and not surrender to Trump’s demands. Jones also pointed to 2018, saying that since Trump was elected in November, a radical populist left-wing candidate Andres Manuel Lopez Obrador has seen his popularity rise. "He's gone from being roughly third in the polls to first in the polls," Jones said.